The New SAT has arrived and with it come many changes. All this uncertainty can cause test anxiety. However, take heart worried SAT preppers! Magoosh is here to clear up those doubts by giving you everything you need to know about the new version of the exam. 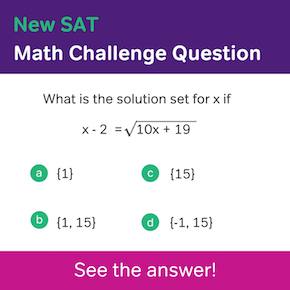 In this post, I’ll break down the important updated features of New SAT Math. Test-takers were previously allowed to use a calculator on every SAT problem. Now one SAT section allows calculator use, while the other prohibits it. You might assume that the no-calculator section of SAT Math (which has 20 questions) would have easier problems than the calculator-allowed section. Actually, the opposite is true. This 15-question no-calculator SAT subsection is designed to assess your ability to do complex, multistep questions without a calculator. So the problems can actually be quite complex. Be prepared to do things without a calculator that you might normally do with calculator help. 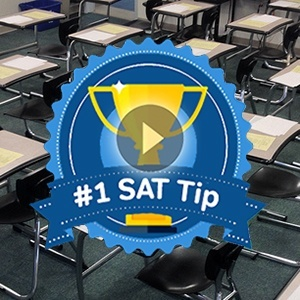 Section 3 of the New SAT, the “Math-No Calculator Section,” is followed by the fourth and final section of the exam, a 38-quesiton math test where calculator use is permitted. This longer section contains a handful of really difficult questions that may require heavy calculator use. For the most part, these 38 questions are actually easier than the ones in the previous section. What’s being tested here is your ability to know when to use a calculator and how to use a calculator correctly. You want to avoid using a calculator on the easiest questions in this section, as calculator use can needlessly complicate an otherwise simple question, increasing your chances of error. Even on the harder questions, it’s probably best to use the calculator for checking your work, not for the initial problem-solving operations. Prior to the New SAT, the exam included a few statistics and probability questions, usually 4 or 5 and up to 6 or 7 at most. Now you can expect at least 10 questions that directly pertain to statistics and probability, and a total of 20 or more questions that touch on these math principles in some way. Expect to review a lot of data tables and charts, making data-based calculations and predictions. Also be prepared to convert story problem information into equations for stats and odds. Be sure to know key vocabulary for statistics, words such as mean, median, range and so on. In its older format, the SAT had around 20 questions related to algebra and common math functions used in algebra. Today, the College Board officially lists a 19-quesiton SAT Math category devoted entirely to Algebra, called the “Heart of Algebra” section. In addition, there’s a subcategory of questions the College Board calls “Passport to Advanced Math.” This 16-question group has an advanced algebra component. It also includes other advanced equations and functions that are to higher-level algebra. Before the College Board rolled out its March 2016 SAT Math changes, geometry was a huge part of the exam. There used to be 14-16 geometry and measurement questions on the SAT. Now on the New SAT, there are just 6-7 questions related to geometric principles. That being said, the New SAT includes some geometry problems that are slightly more advanced than before. Specifically, the New SAT is introducing a trigonometry component to its newer, shorter geometry question set. Trig focuses on advanced calculations related to angles. The trig component in the New SAT is very basic and is unlikely to touch on high-level trigonometric functions such as sine or cosine. Instead, trig may be a partial aspect of a New SAT geometry problem. An example of a typical trig-related SAT problem can be seen on Khan Academy’s YouTube Channel.